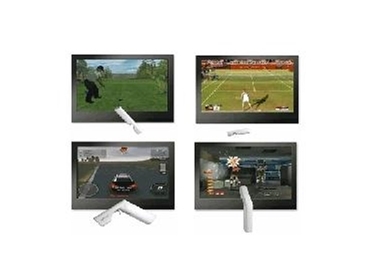 Available from PIONEER Computers Australia , V11 PC game motion controller enables users to play WII-like games on a PC and Notebook. The V11 PC game motion controller provides 3D motion-sensing for 1:1 real-time response allowing the user to experience realistic game play with embedded 3-axis accelerometer and 2-axis gyro. The ergonomic transformer design provides 5 modes in 1 without any additional add-ons. Simply twist to transform between game modes. The V11 PC game motion controller is compatible with all OS platforms (even Macs) and features a duo-function device in the game controller and air mouse. The motion controller is plug-n-play so there is no need to install or configure software for connecting the controller to a receiver. The 2.4G wireless USB connection works up to 10 meters. The PC game motion controller supports all PC games and there is no console needed. The patented mapping tool can transform any PC game traditionally played with a keyboard and mouse into a motion-packed experience.